This is a sponsored conversation written by me on behalf of HuePets. So… When I was younger I was obsessed with virtual pet sites and those little tamogatchi and nano babies. If you grew up on the Internet or have kids, you probably know what I’m talking about. These sites are super fun, addictive, and safe for kids! What’s not to love? 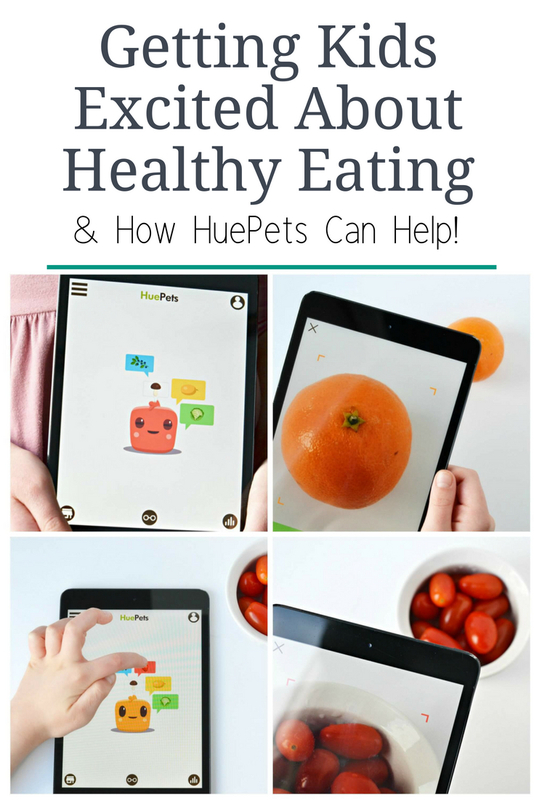 So I KNOW that if HuePets had been around when I was young… It would have definitely got me excited about eating healthy. Listen, almost every parent in the world will probably tell you how hard it is to get kids to eat healthy, I’m definitely not here to argue that fact! These days, most kids have a tablet or cell phone in their hand at some point in the day, so why not use that fact to your advantage? Load your device with the HuePets app and watch the magic happen. The app is super cute and easy to use. It’s perfect for kids of all ages and the easy (but genius) concept can encourage any kid to choose healthier options. Kids can look through their fridge or cupboard and find a food they want to eat, snap a picture using the app, and feed that food to their HuePet too. As your child feeds their HuePet, it hatches from an egg and grows as they feed it healthy foods. They earn coins and rewards that they can spend to dress up their HuePet, giving them goals and a reason to choose the healthier options. Parents can track their children’s activity and will get meal suggestions based on that activity. 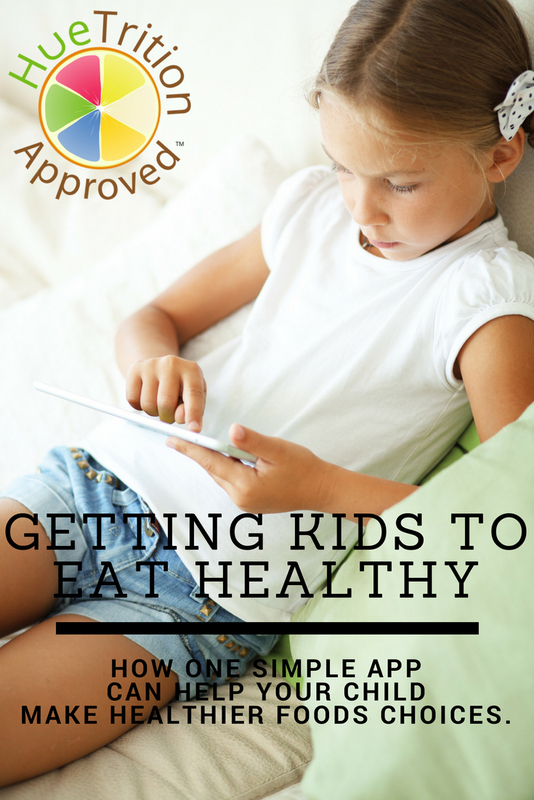 This allows parents to plan meals that their kids will enjoy. In turn, this will get the kids excited about healthy eating, because the meals are foods they are already choosing themselves! The app works for both snacks AND meals, so your child can choose an apple at snack time and then they can help parents choose what they want for their meals. Kids are more likely to eat meals prepared by their parents when the child has a say and gets to help with meal prep, plus they will get to feed their HuePet! At HuePets, their philosophy is simple: Food as Fuel to Color Your World. That is why they have created an app to teach your kids that eating your fruits and vegetables is fun! 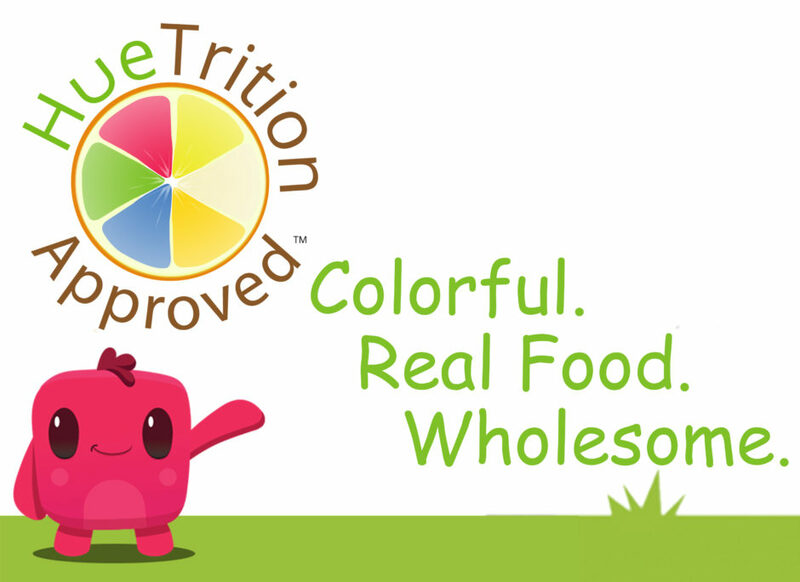 They make it easy to serve your kids healthy foods with HueApproved products, brands, restaurant dishes. Parents can check out their series of HueApproved products. In the future, you may even be able to ask a nutritionist a question! At HueTrition, they divide foods into five categories, grouped by color: blue/purple, red, green, yellow/orange, and white. Dividing fruits and vegetables by color provides an easy way to incorporate nutrient needs and health benefits into our diet. You should aim to consume one of each of the 5 colors every day. Sign up for their Hue-Newsletter (look for the pop-up box for some fun freebies too) and check out their HueTube – YouTube channel that will be loaded with healthy tips! Make sure you check out all the cute HueGear! Natural, colorful, filling half of your plate with fruits and vegetables solves a lot of problems! No need to sweat it! Think of your plate as a colorful canvas. The HuePets app is free to download and play, so I encourage all of you to give this awesome app a try! Find it in the iTunes store here. Find it in the Google Play store here. I like the Criteria for HueApproved Foods….keeps it simple! That’s really an awesome way of teaching kids to eat healthier – luckily for me my grandson loves fruit and vegetables! ! Awesome ideas! Thanks for sharing. Getting kids involved sure is the key! This looks and sounds super helpful and easy! Thanks for sharing! My kids are really picky eaters so I think that I will show this to them to see if it encourages them to eat more of a variety of healthy foods. This is great! Anything that encourages kids to eat more healthy is a plus! Fantastic way to encourage kids to make good food choices. What’s not to like? This is a great approach to helping kids eat healthy foods! I love the idea of this! SO helpful to parents and kids! I wish this was available when my child was younger! This seems like a really neat idea. I think it will appeal to most kids! Great way to make children eat fruits and veggies! My kids give me a challenge each night to eat their veggies and even some fruits! Nice blog and good advice. Thanks!